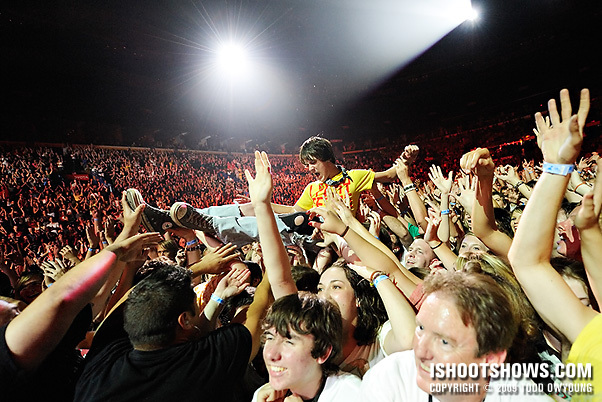 August 11, 2009 – Catching up with Green Day on their arena-busting 21st Century Breakdown Tour was a rush, to say the least. 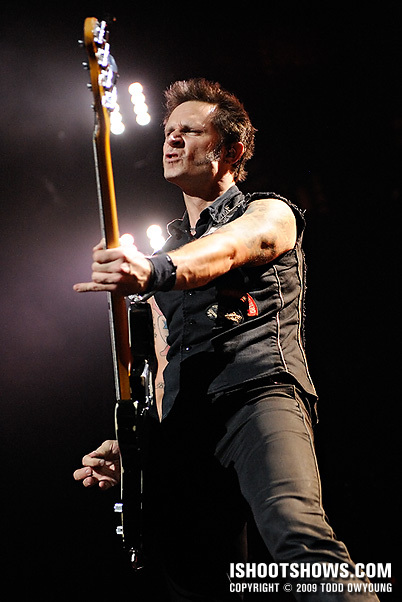 Two songs, three aging punk rockers, and 15,000 screaming fans later, here are the goods. Two songs, but I'll be damned if Green Day didn't make it feel like three. 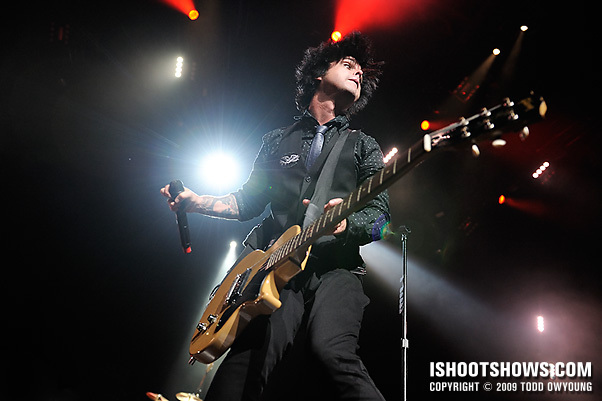 This was a super high-energy show, and Billie Joe and crew rocked the huge stage with a fantastic presence. The setup for this concert included a catwalk out into the audience that terminated in a small T-stop stage at the end. The barricade wrapped around this ramp, so it was possible to move around a fair degree. Still, due to the length of the stage, the other photographers, and security all jammed into the pit, I kept cross-catwalk traversals to a minimum. 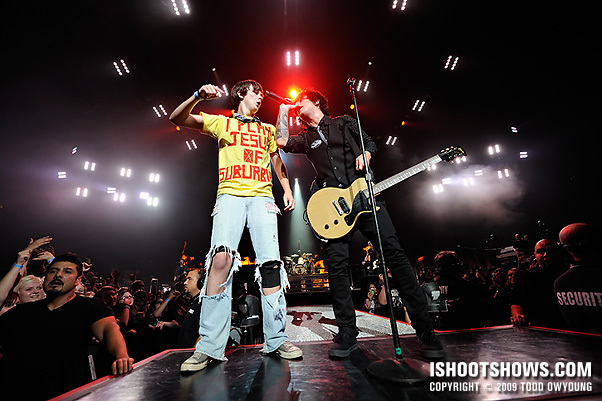 I started off stage right, just where the catwalk met the stage, where Billie Joe's mic was setup. 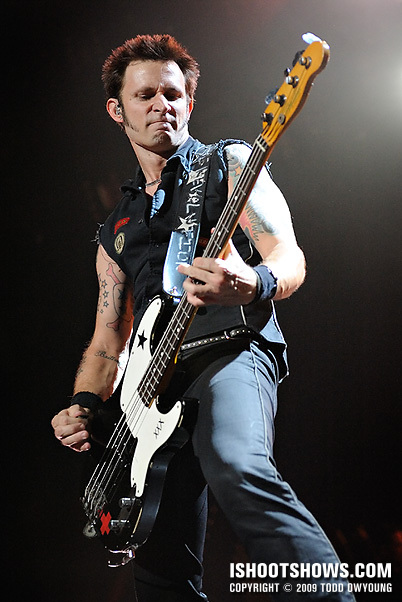 Bassist Mike Dirnt's mic stand was positioned stage left, but he moved around the stage to such a degree that I didn't feel like I was missing out to any large degree working the right side of the stage. During the second song, I moved to a stage left position, but honestly didn't feel there was a tremendous benefit either way. The band plays to both sides of the audience to pretty equal degree – or in other words, which ever way you go, left or right, the shooting is solid. 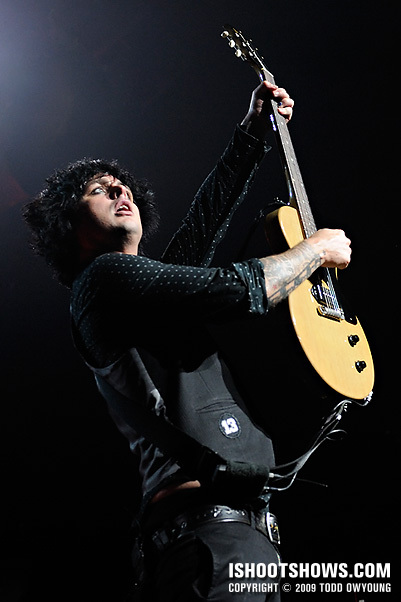 Toward the end of the first song, Billie Joe jumped out into the lower part of the bowl (not the GA floor) and went climbing about halfway back into the stands. Around this time, Mike came out to the catwalk to show the fans some love. 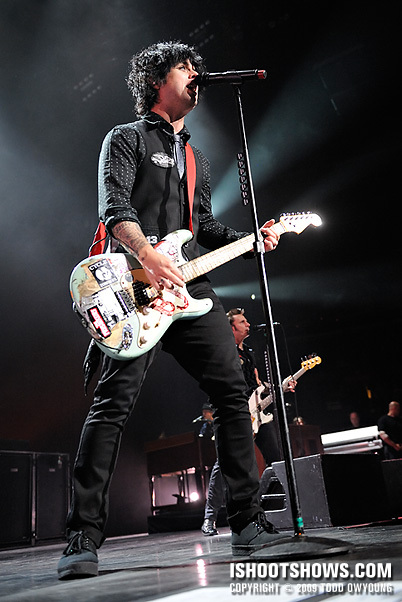 Due to the shooting angles, I considered Billie Joe a loss and focused on Mike at this time. 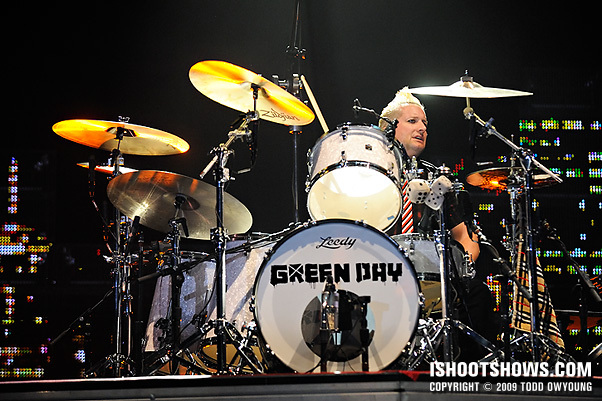 In hindsight, this would have been a good time to run over stage left to pick up some shots of Tre Cool, too. 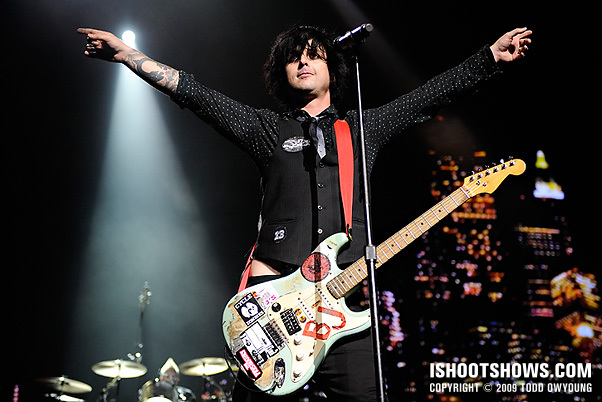 Toward the end of the second song, Billie Joe came out to the end of the catwalk and pulled a fan up on stage. They sung a few bars, had a small heart to heart, and the fan launched himself out into the crowd. I have no doubt that kid is going to remember that moment for a long time. Pretty rockstar. I shot this set at a comfortable ISO 1600 – my favorite ISO on the Nikon D3 and D700 cameras. Naturally, I'd like to shoot as low as possible, but the files are just so clean at ISO 1600 with these cameras that I'm happy to shoot there all day and all night long. No noise reduction is required, and that's a beautiful thing. As far as lenses go, I used them all. The Nikon 24-70mm f/2.8 saw the most use, but I twisted on the 14-24mm f/2.8 and 70-200mm f/2.8 for good measure as well. This is just one of those shows that can lean a number of ways regarding lenses. You can go wide angle, telephoto, and anywhere in between, and I think you'll get great shots. One thing I will say is that shooting with two bodies was immensely helpful for this concert, given how much the band moves around. It was very helpful to be able to put down the 14-24mm one second and pick up the 70-200mm the next. A catwalk extends out from the center of the stage. You will be allowed anywhere in the pit area and around the catwalk. 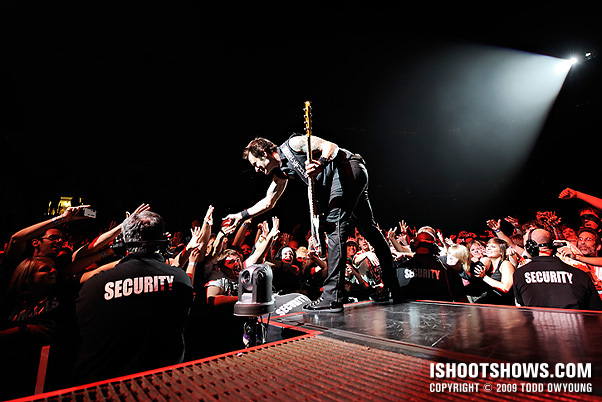 Depending on how many photogs will be at your venue, you may be asked to stay where you're at as the band's security guards need to follow the guys when they head out to the catwalk. One night we had 13 photogs and had to stay put. The next night we had 7 and moving around was a bit easier. I think great shots can be had from anywhere, really. You're dealing with great photo subjects. But I made a gut call after seeing some images from a newspaper gallery from a few weeks back. The photog was at the very end of the catwalk. Might be a neat spot for the limited amount of time they are out there but the rest of the time you'd be shooting down the catwalk at BJ and Tre or you're shooting over the crowd at Mike. So I knew I wanted to be closer to the stage. The first night, I chose to be in the corner where the catwalk extends out from the front of the stage (stage-right side). The photogs were pretty jammed in so that's where I stayed. I like wide angles with the edge of the stage in the foreground and fish-eyes that incorporate the crowd or lighting rig. 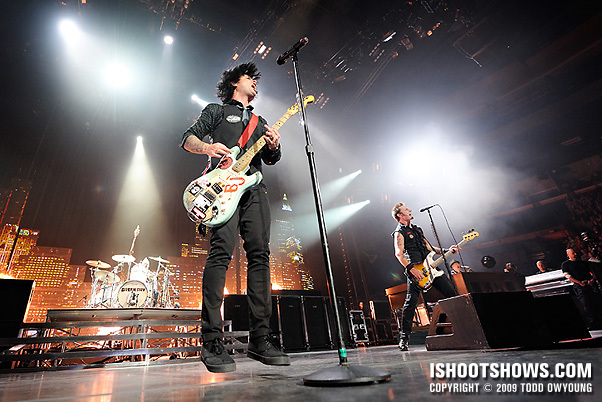 Wide angles from this spot allowed me to frame BJ between Tre (to the left) and Mike (to the right). From here I could also get a nice close-up of Tre with my 70-200mm @ 200. It's also a good spot to get Mike at his mic, shooting across to stage-left at about an 80 range. A monitor will be in the way so you'll likely lose below his knees. The second night, I STILL didn't go out to the catwalk area. The softer angle didn't lure me in. Instead, I chose to hang on the opposite side, stage-left. Because we entered from the stage left barricade, I made sure I was the last in. I had the front stage-left corner of the catwalk entrance and the entire pit area stage left as the rest of the photogs were jammed around the catwalk. 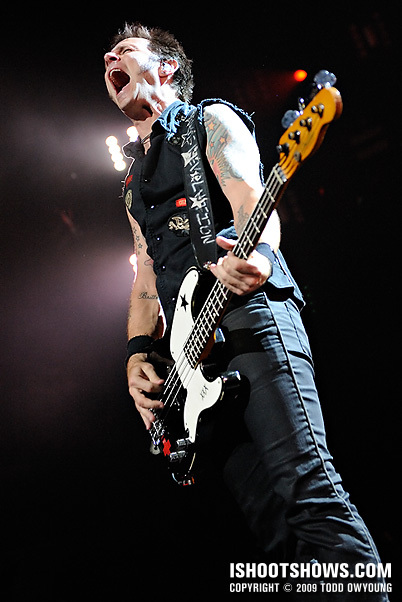 This put me in a great spot to get another angle on Tre (his entire left side) and some close wide angles on Mike. If it's not too crowded, you can take a few steps out into the catwalk area and lean in over the edge of the catwalk and shoot back at BJ and the stage. Also, you can lean in over the edge of the catwalk and shoot out towards the end of the catwalk and capture BJ and the crowd when they're lit up. Towards the end of “Know Your Enemy,” BJ brings up a fan from out at the edge of the catwalk. I preferred not to be trapped in the catwalk area, unable to go one way or another. You can feel it out during the opener. And if you like my rationale, then pick your side and determine whether you need to be the first one in or the last, depending on which side you enter from. If you have 6 or less photogs, you should have decent mobility. Great set of notes Todd (and Chris). 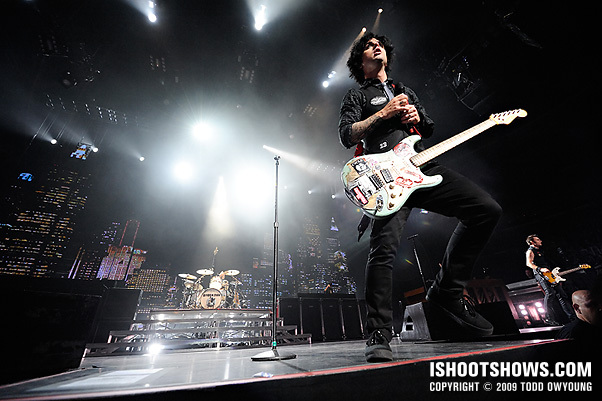 I wish I was able to shoot one of the Green Day shows but unfortunately missed them due to summer vacation. Hey Andy, thanks for the comment. 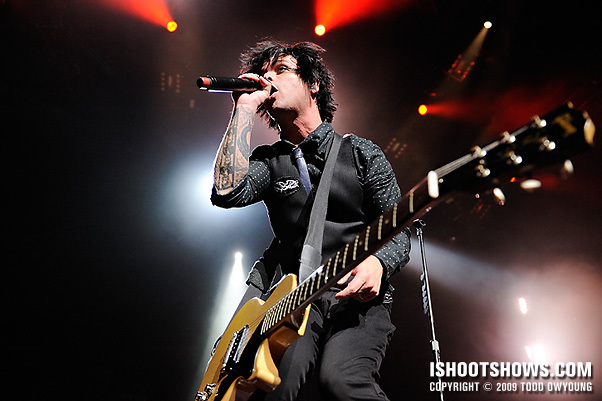 Hope you get to shoot Green Day next tme around! I just envy how your photos are still so nice and clean at ISO 1600. My 450d is messy in that ISO so i am stuck at 400. Tsk. Hey Roxanne, nice to hear from you. I love the D3. On the D2x, which I shot before the D3, ISO 1600 was easily a few stops worse. Of course, now I’m a little spoiled, as with the next generation I’m going to expect that ISO 3200 and 6400 are just as clean. Amazeing! 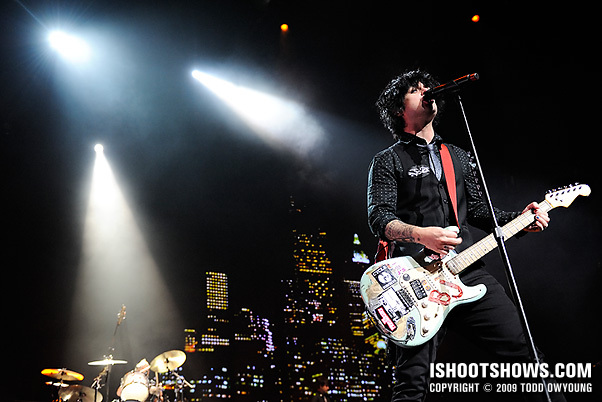 greenday is awesome i have listined to there stuff since i heard Dookie! anyways amazeing photos! 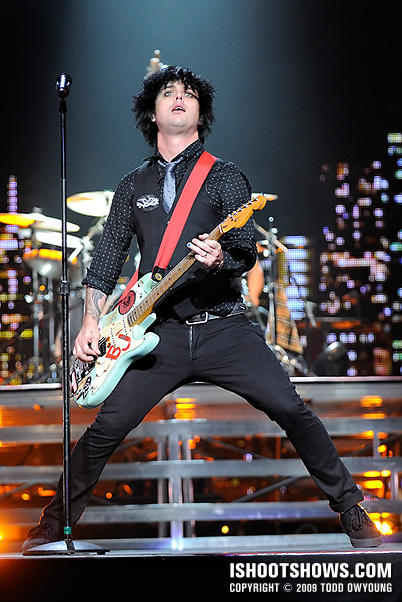 I love the one where you caught billie joe in a small jump! 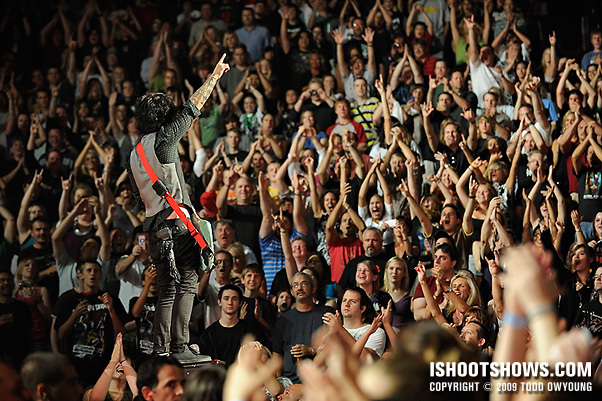 another one i love is billie pointing and just a sea of crowd behind him, I have a feeling ill be reading an arrticle about greenday and see that photo in there! no doubt! Thanks for the comment. The band did have a few jumps in there, but the only one I really have here is BJ’s small pogo hop. But the band in general was amazing to photograph – lots of energy and they worked the stage like pros. Thanks for the comment. You’re right, this set did have a darker look in some ways, so yours is a keen comment. The band was lit by spotlights from the front and, while there were lights from the back of the stage, overall the treatment was thinner than some of the recent big shows. There wasn’t as much “atmosphere” during the first two songs. One tricky thing with this show is that the spotlights can be fairly harsh due to the distance between the subjects and the source. There isn’t ‘much to be done about it, but it’s a consideration nonetheless. Another great set and you tweeted more photog details, I cannot tell you what a difference that kind of detailed makes for me as a student of concert photography, your generosity is amazing. I was wondering about your pit activity, I know I am not aggressive in the pit and if its packed I usually just hunker down and make the best of it, how about you, how do you manage to make your way thru a packed pit, especially with $10K of glass and bodies around your neck? PS. COngrats on the DMB cover, just too cool, its really just reaping what you sow, sow on dude! PSS Greenday aging rockers, man you know how to make an old man feel really old, they are stuck in my old mind as a newer wave of musicians but then I did the math and i’ll be damned if you weren’t right, they are old! Damn that makes me ancient at 49! You should thank Chris in Florida as well – he was nice enough to email me shooting notes before the show when he saw that I was covering this tour, which I welcome for anyone who has shot a gig I’m about to cover. As for hustling in the pit, you just have to make it happen. Obviously it’s not possible to move all the time, given security and other photogs, but if you want the shot, make it happen. I don’t carry a huge camera bag, which helps. My cameras are on my shoulders or in my hands, and the third lens is in a small waist back (or if it’s the 70-200mm, on a strap). I have a Crumpler 7-Million Dollar Home, but I only really use it for storage and transportation. It’s too bulky to use in a crowded pit if you’re wearing it. Green Day aren’t that old, but they aren’t spring chickens anymore at 20+ years after they formed. Great Frames Todd, super show. I usually can’t use 1600 ISO, the smaller shows i shoot have much less lights, so I’m usually at around 5000 ISO. So I would have to assume these high end shows have obviously a lot more lights. Still I use a fast shutter to freeze the action, so i’m curious what you use for these sharp frames. My shutter speed was between 1/160 and 1/500 for this show. Yes, arena concerts like this usually have plenty of light – it may be harsh, but there’s enough of it. Thanks for the comment. 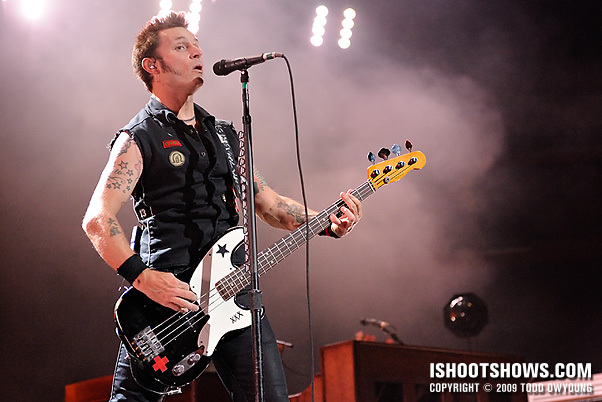 Green Day gave you two songs… it felt like three… and your coverage looks like seven. Beautiful job, Todd! Like you, I would welcome and devour any and all notes, tips and perspectives of coverage. But no amount of advance information would change the fact that when the lights go down, a portion of the process is unconscious. Thanks again for your notes. You’re right – that despite any and all efforts to plan, when you’re in the pit and the lights go down, it’s still “do or die” time, which often means relying on instinct and intuition. But still, I’ll take some crib notes, research, and pre-game any day of the week over not. The shooting notes were valued. One thing about some of these big arena shows is that I almost always shoot more than smaller shows. The lighting is generally better, the stage performance more varied, and the adrenaline rush more intense than at smaller gigs. Todd, nice set. 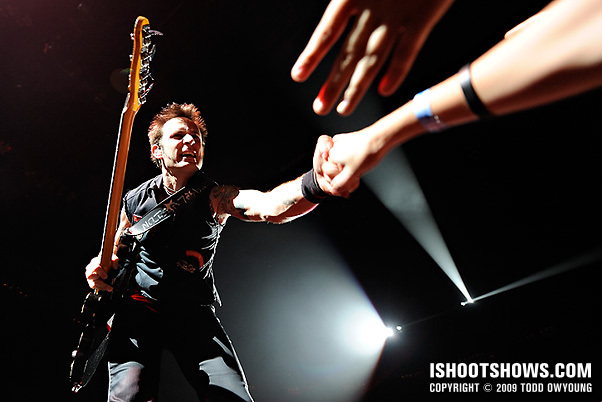 i esp like the one of Dirnt reaching down to the fans, arms outstretched…great angle. Thanks for the comment. If I were security for this show, I wouldn’t want photographers running around either. There was not much room to move in the barricade. I agree with your disagreement and your point about “campers.” However, my notes did not suggest staying put. I said “you may be asked” to stay put, as we were. That could’ve been the call of the arena staff. Even with a crowded pit, we still moved around a bit, but not from stage-left to stage-right or anything. fair enough; i wasn’t condoning running around; more of a swap places scenario. To be clear when I “camped” it was at the back of the pack letting the more agressive shooters do what ever they want in “prime” up front locations, my 70-200 brought me in plenty close even from 20′ back. An yes thanks to Chris for all his detailed notes. Todd, have you shot M. Ward? I will be shooting him this Sunday. Wondering about tips on shooting him, I have read that he is not super dynamic live but is one helluva singer, songwriter and musician! I have not shot M. Ward. You can always do a search in the upper right of the sidebar if you want to see if I’ve made a post about a certain performer. Singer-songwriters can be tough acts, but hopefully the tour has some nice production. Thanks again for the valuable shooting notes! Gorgeous shots Todd, as always! You’re welcome, I hope the photography notes help when you shoot your date of this tour. You’re going to have a blast. Great shots, as always. This set really makes me regret having to miss shooting this show. Thanks for the photog notes, as well. Have a great Friday! Hey James, thanks for the comment. Hope you get to photograph Green Day next time around. Was looking forward to your Green Day shoot and definitely not disappointed! Had a chance to go to their show in their Vancouver stop and I gotta say, aging rockers bring it waaaaaaay more than alot of the young ones. Yes – while youth is one thing, experience is another. A lot of the best shows I’ve seen this year have come form veteran bands that simply have a really tight live show. They’ve got the showmanship aspect of the live show down. Thanks for the comment, glad to hear you liked these shots. I had already commented on that first shot on your flickr. That shot alone would’ve worth shooting the show, but you managed to get more great shots (that show with the bassist grabbing the hand of someone in the audience is great too). Lot’s good moments that capture the vibe of a GD show and transmit it to whomever is watching the shots. And damn … do those wide angle never seize to impress me. That 14-24 is really a sublime one. 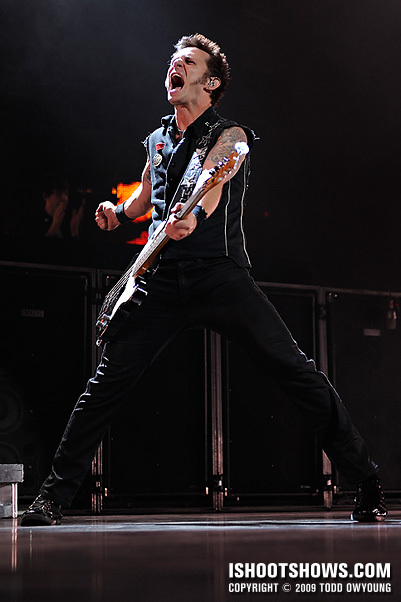 Todd, I’m shooting Green Day this thursday and this has SERIOUSLY boosted my excitement. 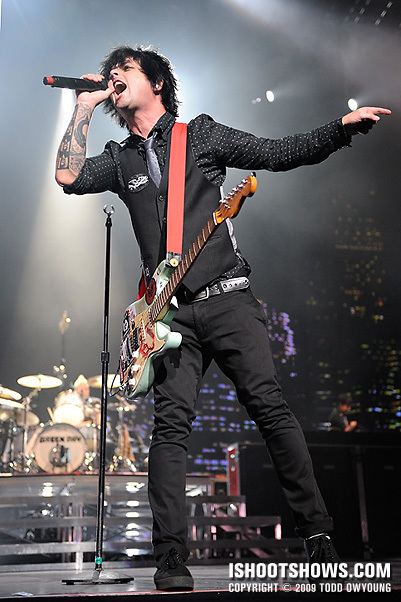 I’m still way nervous, because Green Day is like the Beatles of my time, but I can’t wait. Your images are so smooth, I can only pray for the same. Thanks friend! Hey Jonny, thanks. You’ll have a lot of fun photographing this concert – there’s plenty going on at all times, so it’s like a candy shop for music photogs. Though you only get two songs, I think that the band stretches everything out quite a bit, so it feels longer and I think there’s enough time to do all the work. Good luck! I think it’s amazing how well they stand out in these pictures with black clothing and a black background. That’s a tricky thing. Great job Todd! Hey Tanya, thanks for the comment. Yeah, the black-on-black clothing can be tricky, especially since there wasn’t always that much separation with backlighting. Thanks! Thanks for all the info Todd! It really means a lot to me that you share this. Your work is amazing,my goal is to someday shoot half this good. Thanks again man. Hey Tony, thanks for the kind words, glad to share this info.